If you are like us, you look forward to summer. Summer is full of warm weather, (or HOT weather if you live in San Jacinto or Hemet) barbeques, beach trips and fun with friends and family. You might even be looking forward to your favorite aunt’s annual visit, but we’re sure this ant is not your favorite and you certainly do not want to let these ants get too comfortable too quick. For most homeowners, ants appear as temperatures increase in spring and summer. For others, ants are a year-round battle requiring routine pest control services. Ants come inside due to the hotter weather and lack of rainfall as well as a decrease in food sources (ants LOVE the honeydew secreted by aphids). We have been busy scheduling a lot of San Jacinto ant services and it’s not even officially summer quite yet. Argentine ant infestations begin outside, typically along sidewalks and driveways and also in gardens and areas of vegetation. Argentine ants have multiple queens and are able to reproduce quickly. Satellite ant colonies are set up with workers flowing between nesting sites. Ant infestations aren’t limited to individual residences and often span large areas, including neighborhoods. AmeriGuard Pest Defense provides pest control services in the city of San Jacinto. We understand the climate, weather patterns and geography of the city of San Jacinto and use the right products to achieve ant control. A San Jacinto ant service will begin with an exterior and interior inspection of the property. Any potential ant harborage areas will be identified and addressed. Argentine ants often trail along edges of baseboards and other structural guidelines. Argentine ants can gain access to a structure through cracks in the foundation. Argentine ants are also found in electrical outlets, vents and other fixtures as well as areas with moisture (water) like laundry rooms, kitchens and bathrooms. Argentine ants need water sources in order to survive. An Argentine ant’s diet consist of plant-sucking insects, including aphids. An exterior inspection will focus on vegetation (ex: rose bushes), trees, shrubs and potted plants. It may be suggested to move potted plants as colonies might become established and not noticed until later. Argentine ants are foragers and will often come from neighboring yards looking for food, shelter and water. They will also build nest in organic debris (ex: leaf piles, mulch), and under rocks and other ornamental landscape features. AmeriGuard Pest Defense typically has same day appointments available for a San Jacinto ant service. We make scheduling easy! Just call (951) 652-0505 to speak with one of our knowledgeable representatives. We will be happy to explain the service and schedule a convenient time that works with your schedule. 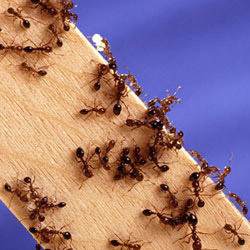 AmeriGuard Pest Defense provides One-Time Pest Control services for ants in San Jacinto. For neighborhoods where Argentine ants are present year-round, we recommend routine pest control services on either a Monthly, Bi-Monthly or Quarterly basis. A One-Time service will have a 30-Day Guarantee. AmeriGuard Pest Defense uses specific products for ant control, including Fipronil, the active ingredient in Termidor®. Fipronil is particularly effective because it is slow-acting and provides horizontal transfer, meaning that foraging ants bring the product back to the nesting sites where it spreads through physical contact and affects the other members of the colony. Argentine ants are an invasive ant species that routinely infest residences and commercial structures. A combination of a thorough inspection, elimination of conducive conditions and effective treatment with quality active ingredients will help to control ant issues. For ongoing ant problems, AmeriGuard recommends routine services to ensure your house is protected year round.